Brand New UPR Billet Catch Can Kit for your Ford F-150 Driver side Mount with 3.5L Ecoboost engine. Developed to eliminate oil from entering your intake by engine blow-by, which channels oil and trash into your direct air stream from the valve train. This is a common problem on both brand new and especially older engines, which just suffer more from blow by due to wear and tear. The most common problem is making your car emit light blueish white smoke upon start up or even during normal driving. The throttle body handles your main air stream and has a breather tube running from the crankcase to the throttle body. The vacuum from the incoming airstream and positive pressure in the crankcase combine to get oil in the air tract. Every car and vehicle is set up this way to help eliminate the pressure build-up in the bottom end of your engine enabling the piston to move up and down with less resistance. These catch cans feature a containment system and separator that force all the debris to get captured and contained in the filter while still allowing airflow thus maintaining full function of the breather system. This catch can has been long awaited and is one of the most needed items for the late model performance world. 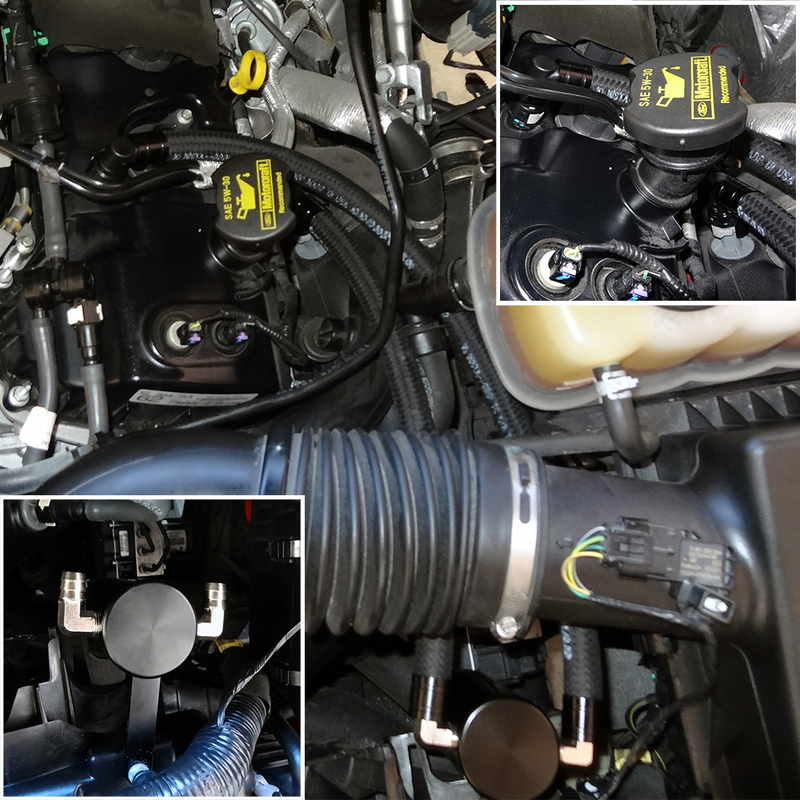 We have had countless customers install our new Aerospace Mustang Billet Catch Can and get immediate results in both idle quality and vehicle performance. Another key problem caused by oil in the intake is that it reduces the octane of your fuel and causes detonation especially in turbo, supercharger and nitrous applications. The UPR Oil Catch Can features a three chamber design CNC machined from 6061 Billet Aluminum unlike some of our competitors models that are single chamber tanks that don't properly trap the oil or debris. 2011 2012 2013 2014 Ford F-150 XLT FX4 Lariat 3.5L Ecoboost Engine. No one else can stack up to the bold clean styling of our aftermarket Billet dress ups, Street Strip & Racing Suspension & Performance Parts for your late model American Muscle Car!